Well, the evanescent cherry blossom season is over and the days are getting long and warm. Last week, when the wisteria vine’s violet flowers were seen hanging from the trees in the mountainside, we first knew that spring is about to fizzle into Amakusa’s long and damp early summer. 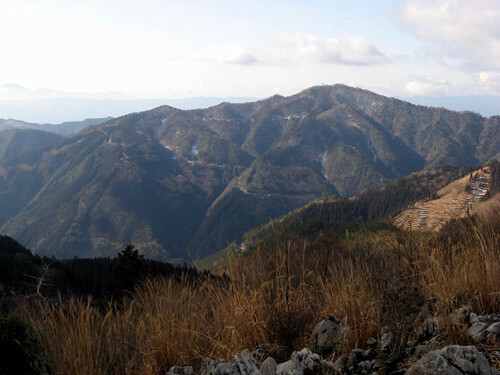 Thus, if our reports are to stay at least approximately seasonal, we should hasten to include our day trip last March to Nokeeboshi-dake, to see the famous Adonis flowers that bloom there even as the mountain snows are melting away. 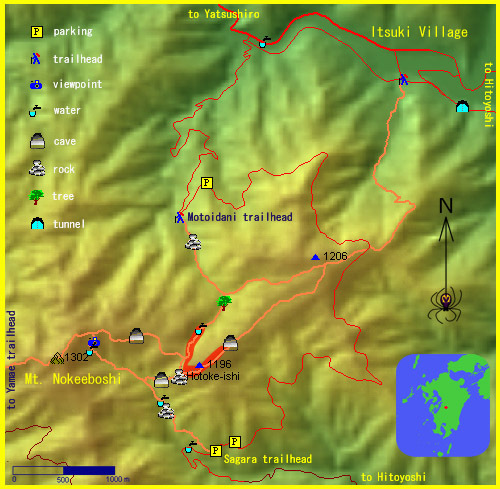 A map showing the hiking trails of Nokeeboshi-dake. The red area shows where the Adonis can be found. Paved roads are red, unpaved (often rough) ones are brown, trails are orange. The main trail is from Motoidani to the summit; the map shows how this (and the seasonal crowds) can be avoided with a little effort. On the weekend of our visit the snow had already melted away on the sunny slopes where the Adonis grow. But the showy flowers were still at the height of bloom. The early bloom and growth cycle of the Adonis is squeezed into the few weeks between the end of deep winter and the sprouting of new tree foliage, which quickly chokes out the sunlight on the forest floor when true spring comes. 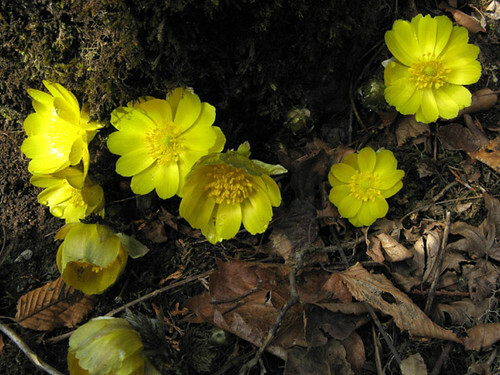 The Adonis plant is hardly more than 10cm tall, yet its bright yellow flowers normally reach 5cm in diameter. This gaudiness is evidently the origin of its Latin (and English) name. Adonis does not wait for the snows to melt completely and the first blooms typically emerge from a cold carpet of white; it seems that their size and brightness are therefore designed to out-compete that brilliant white background in order to attract whatever few insects are already awake in the forests this early in the year. 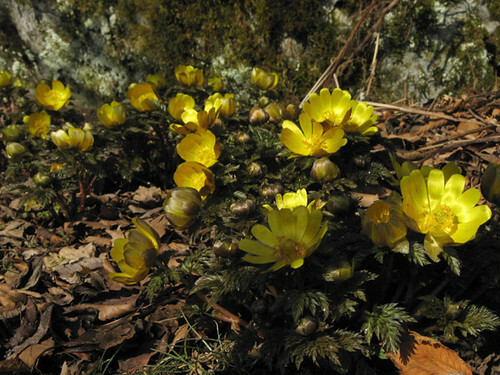 The Adonis grow in groups among limestone outcrops; calcareous soil is a requirement for their growth. For the Japanese, the flower of the Adonis holds a special fascination, to the point where tourist buses are made to navigate the impossibly narrow and twisty mountain roads, depositing crowds of people at the trailheads; the experienced and inexperienced hiker alike then takes considerable risks tromping up the steep icy slopes to take in the admittedly beautiful view of a snowy mountainside covered with large yellow flowers. We Canadians can appreciate going to such lengths to find signs of the earth will eventually waking up from the grip of a long, miserable winter, but this alone cannot explain the locals’ determination and numbers. Maybe it’s also because the plant's Japanese name, fukujusou, meaning ‘herb of longevity’(a bit of a misfit, it seems) attracts folks with the peculiar but ubiquitous belief that the name itself possesses some kind of special power (viz., for example, the aversion to the numbers 4 and 9 for their similarity, in Japanese pronounciation, to the the words ‘death’ and ‘toil’, respectively). Or perhaps it’s the age-old Japanese perception that nature is to be always struggled against, for here seems to be proof that not only people, but evidently a piece of nature is involved in that struggle. And at the end of our eighth winter in Japan, spent in a typically drafty, uninsulated, and unheated home, it was not difficult to find in ourselves, while looking at these flowers, a hitherto unknown feeling of sympathy. 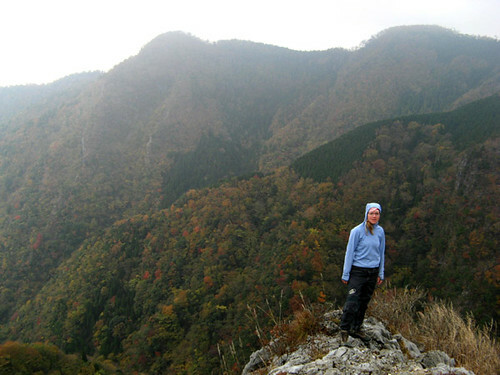 Leanne stands precariously on top of the Hotoke-ishi, or Buddha Rock, a 40m tall pinnacle whose airy summit is accessible via a short scramble, on a cold autumn day last year. Be that as it may, the crowds do show in season and at such a time we’d rather be strolling along the median of a highway. This year, however, we were determined to see these short-lived blooms. Waiting through the prime weekend, we therefore set out to Nokeeboshi very early on a Monday of the following week. After a 3 hour drive from Amakusa, we reached the trailhead at the crack of dawn, satisfied that we were the first on the scene. We then enjoyed a three-hour leisurely, quiet stroll through the hills, seeing all there was to see. It was a wonderful, sunny morning; chilly but with a touch of spring in the air. The trails were still icy and snowed up but the south-facing slopes where the Adonis prefer to grow were already denuded of snow. During this and other explorations found extra trails that do not exist in guides or maps, but can be traveled with a little extra effort and certainly afford a quieter option during busy season. It’s even possible to walk up from the village of Touji (Itsuki) in the valley and thus avoid the approach road altogether (huffing up the hefty hill on one’s own power of course). We show some of these trails on the map above. A view from somewhere along our stroll. The snow was all but gone, but a winter feel remained. Country wisdom and skill is in evidence in this relatively remote region of Japan. 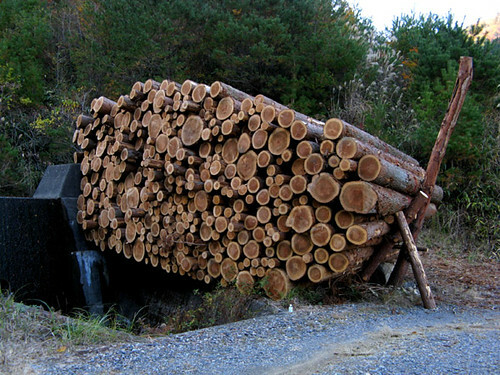 Here several tons of lumber have been stacked in an ingenious, if seemingly precarious way, against the side of a concrete dam. 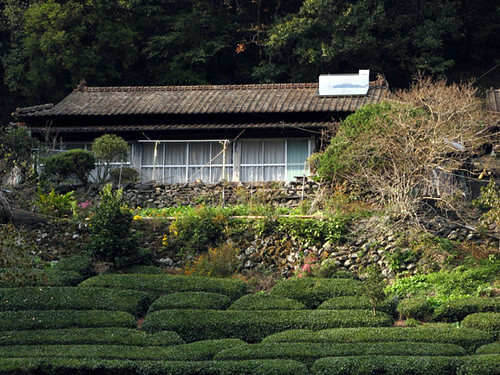 A rustic house stands over its tea garden in a remote valley, its inhabitants clinging to a steadily disappearing way of life. Daikon, a kind of Japanese radish, is hung up to dry outside the modest front porch of a house not unlike the one above. 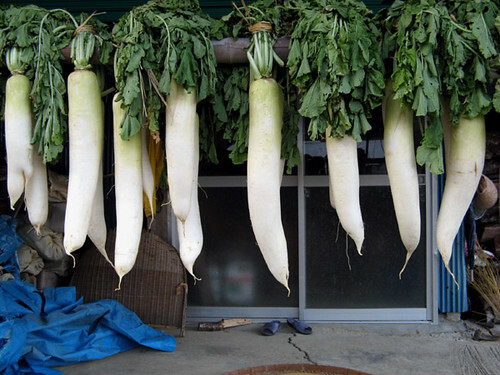 Radishes grow well in the Kyushu climate and are dried, then typically pickled in vinegar to provide a tasty if odorous side dish to meals throughout the year.